I’m in full on sandwich mode here. 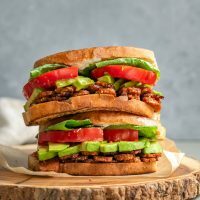 I’ve been regularly chowing down on these vegan tempeh BLT sandwiches for over a month now, so thought it was about time I shared the recipe with you! 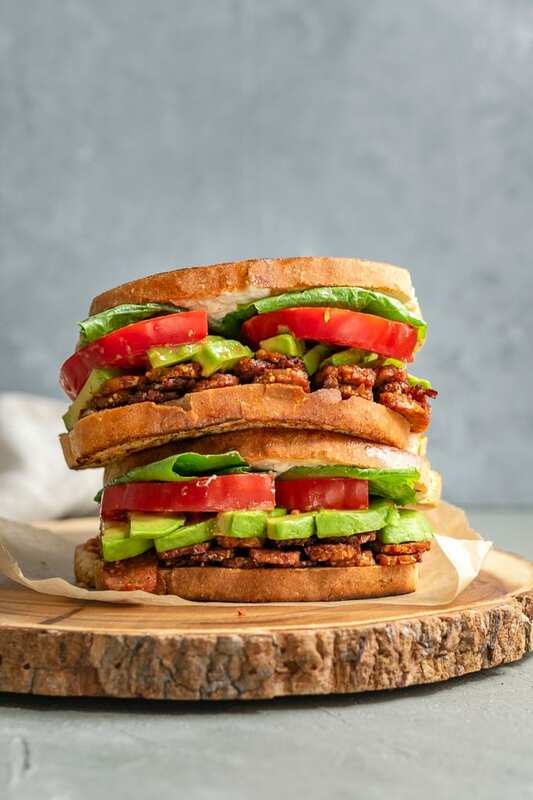 If you’ve yet to have a tempeh BLT, this sandwich is bound to convert you! Meet my favorite vegan BLT. It’s made with salty, smokey, slightly sweet (basically all the descriptive S-words) tempeh. Thinly sliced, marinated, and baked until crisp then stuffed between two slices of bread along with your usual suspects. It’s possibly the perfect sandwich! The most important element of this sandwich is the baked tempeh bacon. 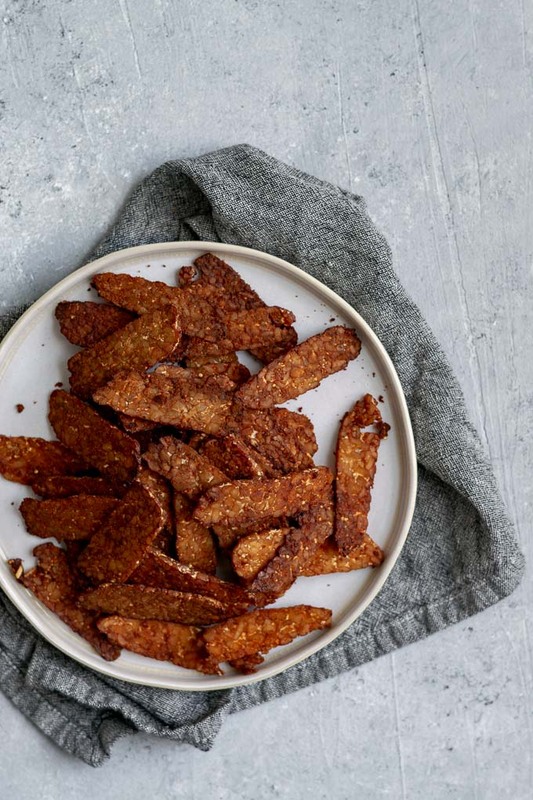 Tempeh is a bit of a controversial choice when it comes to vegan bacon, as it doesn’t crisp up exactly the same way as at the meaty version. Personally, I don’t really care because it’s seriously good as is. I like my tempeh to be sliced super thin. Depending on my mood and how I’m using it, I’ll slice the block of tempeh widthwise or lengthwise. Either way, those super thin slices do bake up to a perfect texture, mostly crispy with a hint of chew. 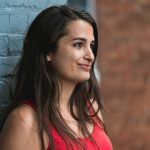 The marinade is made of soy sauce for salty umami, apple cider vinegar for a sweet fruity tang, and maple syrup for its rich saccharine flavor. I add a splash of liquid smoke for its potency, but most of the smokiness comes from smoked paprika. Lastly a bit of onion powder for its pungent and deep flavor, cumin for its earthy nuttiness, and a pinch of salt to finish it off. I marinade the tempeh while the oven preheats, whatever it doesn’t absorb in that 30-ish minutes will soak in while it bakes. With the super thin slices, the marinade infuses completely. Flip the tempeh bacon halfway through for even crisping. 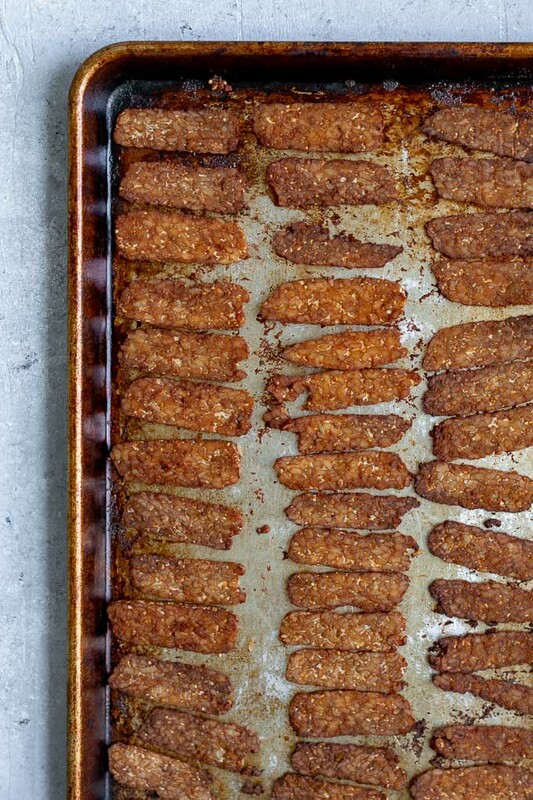 I might be biased, but I think this baked tempeh bacon is perfect. I have trouble not snacking on them hot from the pan! And you’ll definitely catch me sneaking bites halfway through baking, I mean, quality control is of utmost importance in the home kitchen, right?? But if you can resist, it’s worth it to turn this tempeh bacon into the most delicious tempeh BLT. Some might call it a TLT, other’s a TLAT (because, ya know, I had to add avocado), and then there’s Whole Foods with their TTLA. Whatever you want to call it, this sandwich seriously satisfies. 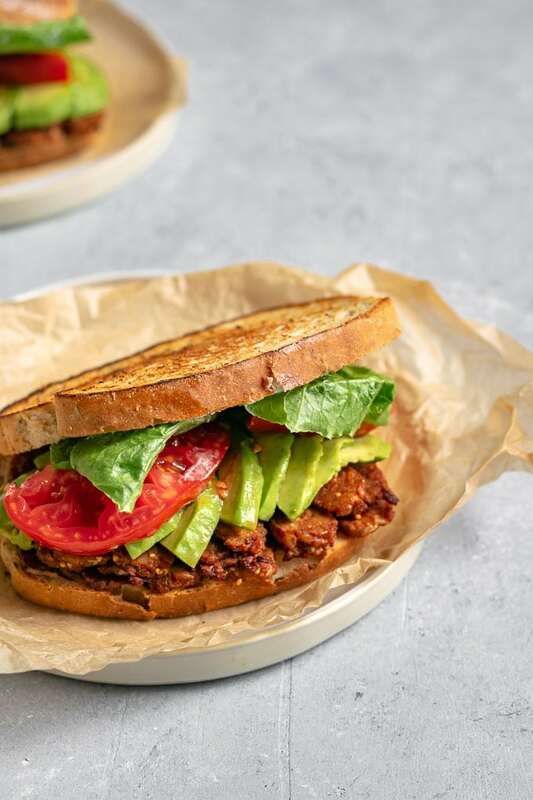 It’s hearty and filling, the combination of salty smokey tempeh with sweet juicy tomatoes and crisp lettuce just dances across the tongue. Creamy avocado adds extra fill-factor, with it’s healthy fats it keeps you satiated longer. I made this sandwich with a delicious rye bread, but love it equally with whole grain. The heartiness and sweetness of whole grain complements the filling perfectly. I like one slice of bread to be thickly coated with vegan mayonnaise and the other some spicy brown mustard. And to me, this sandwich screams for a few shots of hot sauce. To toast or not to toast, that is your choice. If you’re not eating the sandwich right away, a little toasting can keep it from getting too soggy from the tomato. I love bringing this sandwich for picnic lunches or on hiking day trips. It’s great to pack for lunch, or to enjoy as an easy dinner. I recently made these vegan Tempeh BLTs for a group of friends and everyone raved about them! Baked tempeh bacon is so easy to make, I really hope you give it a whirl! 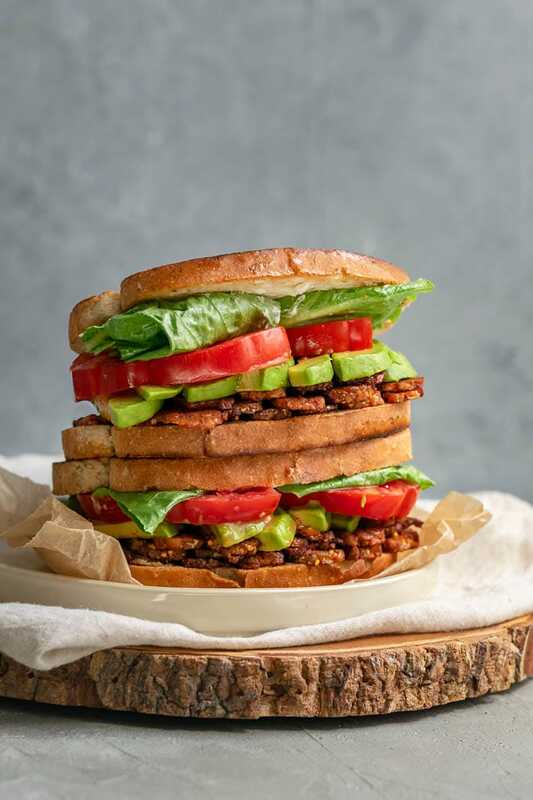 If you make these vegan tempeh BLT sandwiches, leave a comment and rate the recipe below! And tag your recreations @thecuriouschickpea and #thecuriouschickpea on Instagram, I absolutely love seeing your photos! Gluten free? Use gluten free bread and use tamari for the soy sauce. 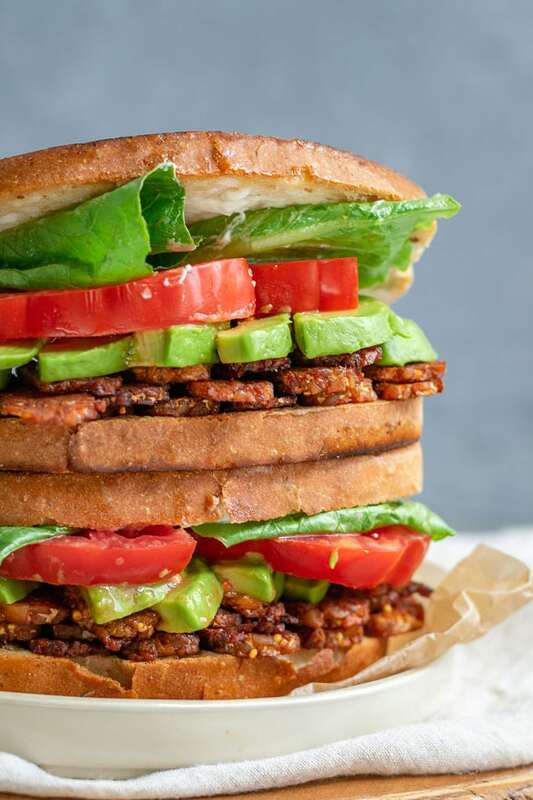 A vegan twist on the classic BLT, with delicious baked tempeh bacon, lettuce, tomato and optional avocado. Prep your tempeh bacon ahead of time for a quick and easy sandwich! Place the sliced tempeh in a baking dish. Whisk together the rest of the tempeh bacon ingredients and pour the marinade over the tempeh. Set it aside to marinate while you preheat the oven, or cover and set in the fridge for up to 24 hours. Preheat the oven to 350 ºF. 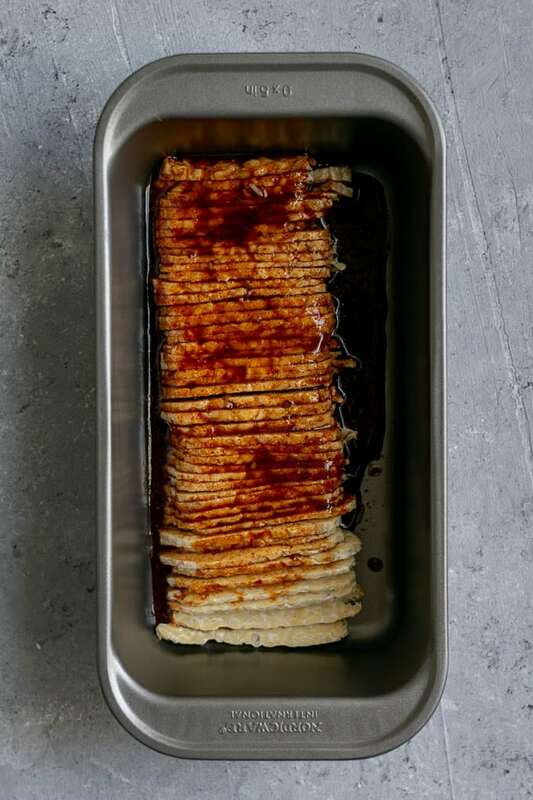 When the oven is hot, arrange your tempeh in a single layer on a baking tray. Bake for 15 minutes, flip the tempeh, and bake another 7-10 minutes until the tempeh bacon is dark and crisped. To assemble the sandwiches: Slather one slice of bread with vegan mayo, and the other with mustard. Layer the lettuce, tomato, and tempeh bacon on to the sandwich, add avocado if desired. If you want you can toast the sandwich on a lightly greased hot skillet until the bread is golden. Enjoy! Tempeh bacon can be prepared in advance and stored in the refrigerator and used as needed! I have never eaten tempeh before and I can only say this recipe blew my mind! So delicious, my entirely family enjoyed it to the crumbs. This recipe for sure is a keeper! Wow that’s so great Sandra! I’m so glad you enjoyed these sandwiches and the tempeh!